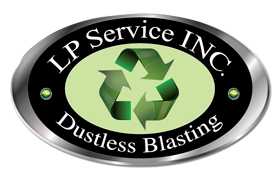 We, at LP Service INC. make our client's project our priority. Using only the best materials available to ensure the best results possible. SAFER, QUICKER and GREENER says it all. Using a vapor abrasive system for sandblasting will increase the profile crushed glass can achieve. Air pressure, air supply and operator experience in sandblasting can influence results.